I was able to put primer on the Skitarri today. I started black and built up layers of progressively whiter grey to get a zenithal effect. I use my airbrush to prime with Reaper brush-on primer. The airbrush might not be the very fastest way to prime a figure but it gives a ton of control which is crucial at this early stage. I used black and white primer in combination to build up a few layers of grey. I start black and add drops of white as I go. 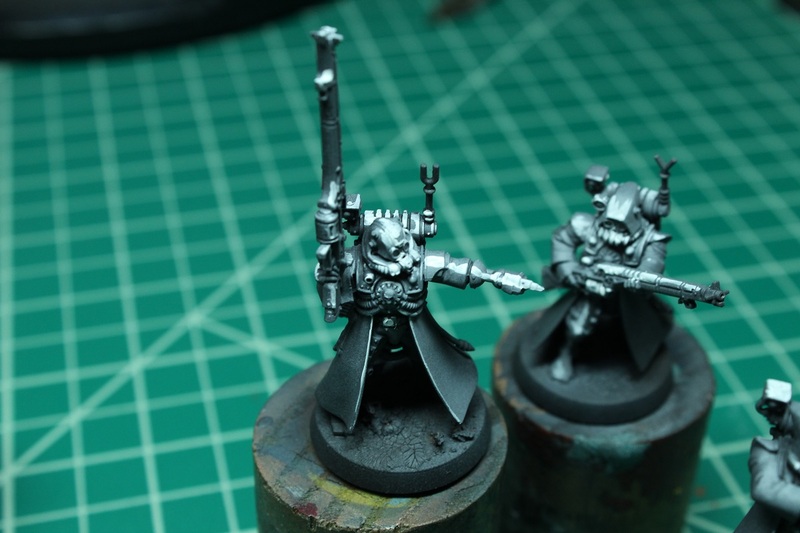 These layers of grey will give me a head start on painting my shadows and highlights. I could have done another layer of white primer, but I wanted to try something different. I took the figures at this point and hand painted some really strong pure white highlights. This is something that Alfonso Giraldes showed me and it worked really well to get to some highlights placed early on. Big ugly splotches of white. This is all going to get quite a bit of paint over it so the sketchy quality of the white will show through only enough to give me some contrast with my first highlights. I just spent a few minutes sketching out where my brightest highlights will be. My next step will be to base coat my primary color with the airbrush over this. 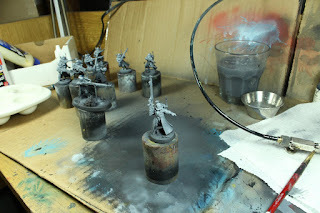 The transparent nature of the of the airbrushed base coat layer will work with this strong highlight to give me strong highlights in tmy base coat color. Thank you for sharing this process of painting the figures with the readers. Please do a post showcasing your mini figure collection sometime too.